Are you interested in becoming an Explorer? 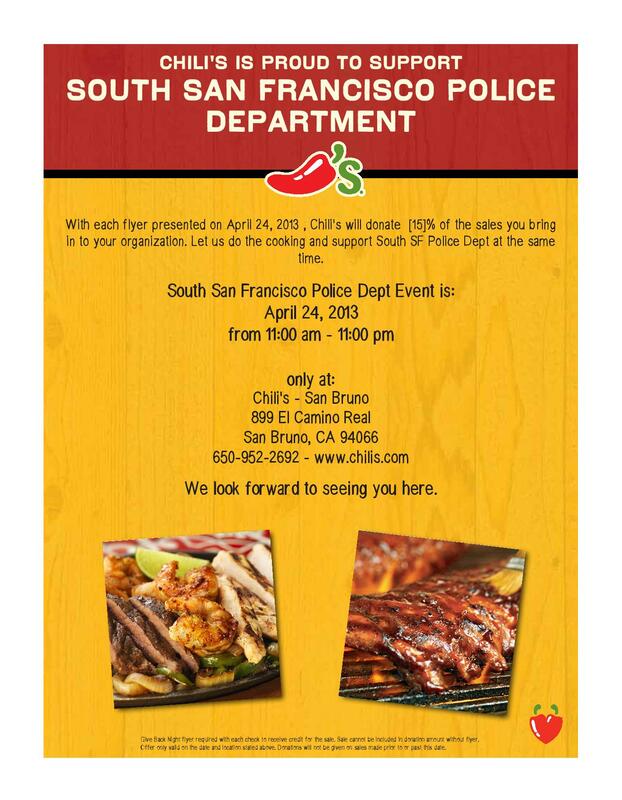 The South San Francisco Police Explorer Post is having two restaurant takeovers on Wednesday, April 24th. 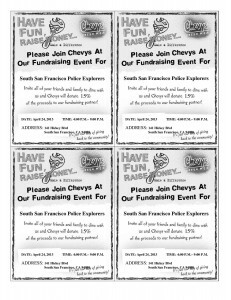 The Explorers do a lot for the South San Francisco Police Department and the City of South San Francisco. They need your support. 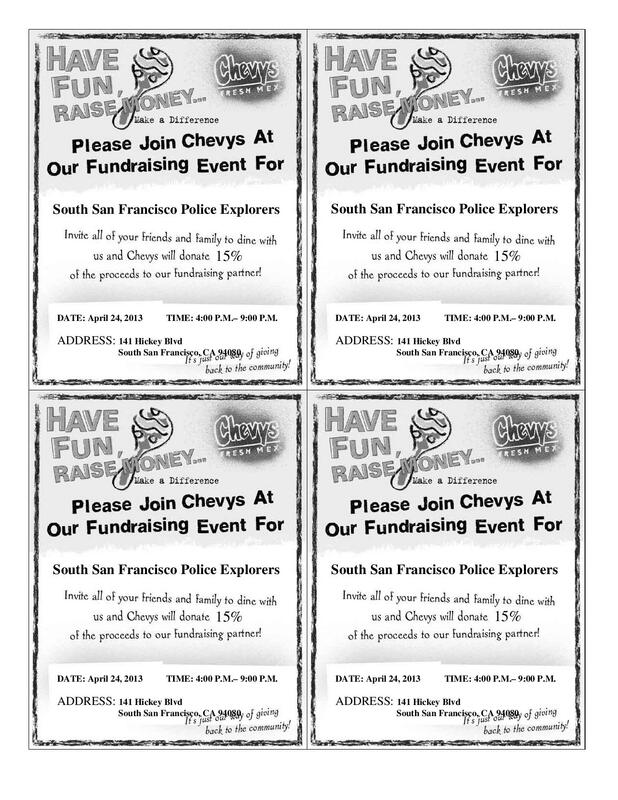 The Explorers are doing this to raise money for the post and for their annual Disneyland trip. Please mark your calendars; your contributions are needed. Attendees MUST present the flyers. 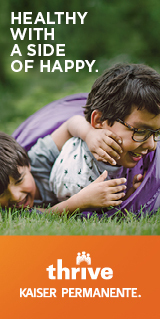 Flyers can be re-printed for multiple usage. 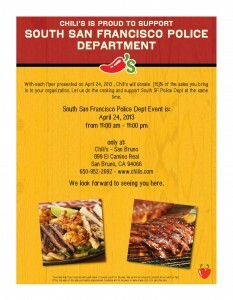 Chevy’s and/or Chili’s will donate 15% of the proceeds to the South San Francisco Police Explorer Post. Are you interested in becoming a South San Francisco Police Explorer? Are you between the ages of 14 and 21 years and either a resident of South San Francisco or attend school in South San Francisco? Interested in law enforcement or want to serve the community? The South San Francisco Police Explorers may be for you. Being involved in the Police Explorer program teaches leadership skills, discipline, encourages better relations between the police and the young people in our community, provides community service, teaches young people the procedures of the South San Francisco Police Department and most importantly, provides life skills that young people will utilize throughout their lives. All new Police Explorers are required to attend a nine-week (nine consecutive Sundays) Explorer Academy. There, they will learn about the law, the ability to work with others, good values, narcotics, discipline and numerous other topics. If this sounds like a program for you, please apply with the South San Francisco Police Department. For further information, call the School Liaison Officer at (650) 829-3924. ← 107 Years Later; Are You Prepared?